Paperclay is an adaptive and innovative medium for the crafts practitioner who is willing to expand boundaries. It was this versatility as a medium which attracted Graham Hay initially and he uses it to full advantage in his work. His purpose is to communicate and comment upon social issues in a way that aims to be intellectually and aesthetically stimulating. 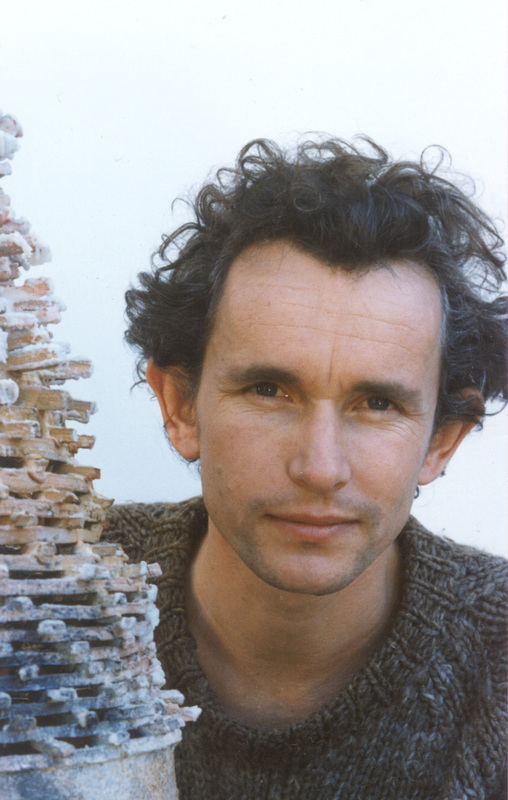 Hay's interest in paperclay was established initially from contact with ceramic technologist Mike Kusnik during studies at Edith Cowan University. Paperclay is particularly useful as a medium because paper is a constant companion in the creation and maintenance of organisations and institutions. Hay's contact with business, government, education and art establishments have formed the basis for analysis and comment on the position of institutions and organisations within the structure of society. Architectural elements are frequently used by Hay as metaphors for institutions and their processes. The bell tower which is often found in classical architecture is used in the work titled "Ancient Tribe". A classic element from a traditional aesthetic is interpreted with almost whimsical instability. The point Hay is emphasising is that a building is not the actual institution and it's never as completely rigid as it appears. "Buildings are not the actual institution and it's never as completely rigid as it appears. "Buildings are not the organisations, the people are, and they regularly change." Within our social structure we are frequently defined by the roles and responsibilies we perform. "Rim to the Centre" comments on people as individuals, and as a collective, making contact with the centre. "There is a block on the rim and a block on the tower. I was making an analogy between the centre, which is a very hierarchical organisational base, and then the rim outside it. The rim is like people around us, in some ways they hold us together. It's quite a fragile structure with tension between those outside and those within it." This particular work was a major breakthrough for Hay in building open structures, they are a reference to the individual or groups of people." A desire to make a structure which had hollow interior space visible through the external walls culminated in the work titled "Blooming Bureaucracy". At its base it resembles classical architecture, a metaphor for organisation. This structure grows upwards and inwards leading to an apex where a lone flower blooms. This single blossom is indicative of the vulnerability of the top position. Tongues are a provocative metaphor which Hay uses to issue a challenge to "ivory tower" institutions and organisations. "Argument" is based on an ivory hunting horn. The "ivory tower" connotes untouchable institutions remote from the real problems of everyday life. The bright red tongues which scar the outside form indicate a challenge to the language and words spoken in these institutions. One of the great advantages of paperclay as Hay sees it, is it allows him to work spontaneously, or alternatively, gives him the option of leaving work for extended periods of time, both equally effectively. In the working process Hay employs a variety of techniques. "Ancient Tribe" was built entirely horizontally, only when it was dry enough, it was turned upright and supported with bricks. A corrugated mould has been used in some areas of the structure along with string multi dipped in paperclay and shapes cut from paperclay slabs. In both "Rim to the Edge" and "Blooming Bureaucracy" he used a pottery wheel and a scalpel to cut rings of paperclay from slip cast slabs. He further cut and joined these using paperclay in a squeeze bottle which was diluted to a ration of 1:5. To create the ivory hunting horn form in "Argument" Hay used a cast slab which was rolled and the surface scoured with a wire brush. Holes were dug out with a knife to hold the string dipped in paperclay which forms the tongues. In discussing his firing schedule Hay emphasises that work can be fired and cooled very rapidly in the kiln. Delicate work requires rapid firing. If firing thin slabs Hay fires at 250C per hour to 200C, then 350C to 1100C with a soak of 30 minutes, then he cools the kiln rapidly. He uses an earthenware slip for his paperclay base. The influence of place and time is often shown in an unconscious way. Hay grew up in the South Island of New Zealand and the influence of place and culture are evident to me in many of his structures. 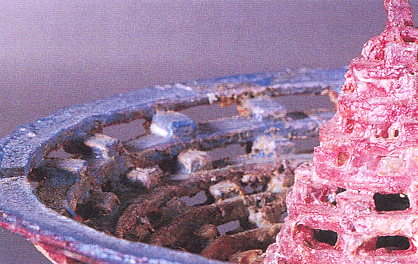 A resemblance to the traditional Maori food storage structure is evident in "Ancient Tribe". Traditionally this was a small structure built high on stilts supports to keep food safe from predators. "Blooming Bureaucracy" could be based on the parliament buildings in Wellington, nicknamed "The beehive". The use of the tongue as a challenge is a significant part of the Maori challenge once known as the "haka". Hay uses the tongue as a challenge in several of his works. Hay is a committed professional who throws all of his energy into creating. He willing expounds the virtues of paperclay to all who will listen. I believe as this medium becomes more familiar and widely used, many clay practitioners will follow suit. 1 Shredded paper soaked in plenty of hot water, blended until pulped. 2 Remove excess water with sieve and sponge. 3 Mix 1/3 pulp with 2/3 clay slip by volume. 4 Pour the porridge-like mixture onto a plaster slab. 5 Keep some paperclay slip aside in a plastic squeeze bottle for use as "glue". 6 Break or cut dry paperclay slabs into desired shapes before building. Stick together with "glue". 7 Recycle dry scraps by placing them in warm water, leaving for one hour, pour off excess water. 8 A few drops of detergent helps prevent the porridge from going off. 9 When working and building with dry clay, a filter mask should be worn. 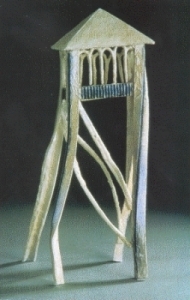 Argument (1994), Earthenware Paperclay, 45 x 10 x 11 cm . Photograph by Victor France. Blooming Bureaucracy (1994), Earthenware Paperclay with plaster base, 59 x 46 x 46 cm. Photograph by Victor France. Ancient Tribe (1994), Porcelain Paperclay, 55 x 22 x 19 cm. Photograph by Victor France. 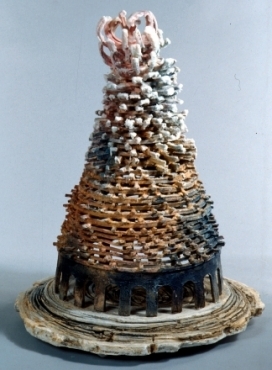 From Rim to Centre (1994), Earthenware Paperclay, 14 x 14 x 14 cm. Photograph by Victor France. More articles on paper clay.